Ever since my interest in beauty was piqued, I've been paying close attention to my skin. I started really looking at it and trying to treat it as opposed to just slapping anything on to mask the problem. Today I thought I'd share my skincare journey. Before I discovered the rather brilliant Caroline Hirons and her equally brilliant blog, my routine consisted of warm water, a foaming cleanser and moisturiser. Don't get me wrong, that unholy trinity served me well for a time, until I began to understand my skin better. I learnt that my skin wasn't just dry, but also dehydrated and I often suffered hormonal breakouts due to my ill health. I know that doesn't sound simple, but it really only takes a couple of minutes. I also don't splurge on every item in my routine. I like to get a more expensive serum and eye cream as they tend to have better ingredients and buy more reasonably priced cleansers and moisturisers. You don't have to spend loads on good skincare. 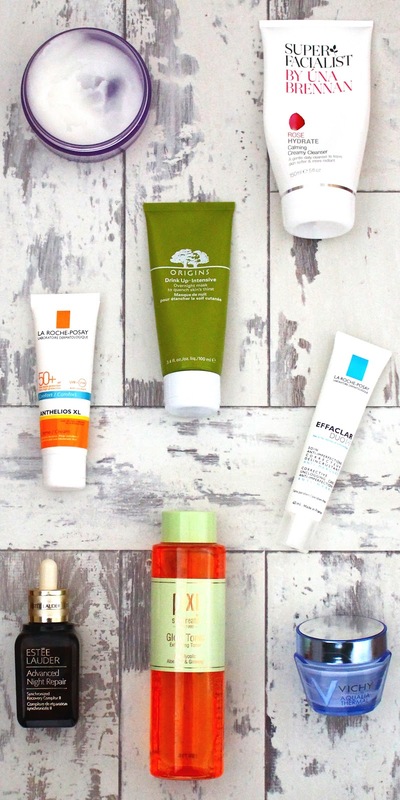 I love brands like Una Brennan and La Roche Posay as they have a lot of different products for different skin concerns. La Roche Posay is more mid end, but the products are so good. The Body Shop is also a great brand that has decent products with good ingredients and they're always running offers. If you want a more in depth drugstore skincare run down, I've done a whole post with all of my favourite affordable products. Being a blogger, I do love to try lots of products which has helped my skin because I can treat it on a day to day basis. The most important thing I've learnt is to listen to my skin, invest in decent products and avoid foam cleansers. I would also like to add that it's really important that you do you. If your routine goes against everything the experts recommend, but it works for your skin, then you go Glen Coco! If you want to know what products I use on a daily basis, you can check out my Winter routine. Tell me about your skincare journey.